The Texas Tribune recently published a video report here about a proposed law before the 84th legislature that would prohibit anyone in the state of Texas from texting while driving. As the report discusses, every legislative session for the last 10 years has at least discussed a statewide ban on texting while driving. In fact, in 2013, Former Governor of Texas Rick Perry vetoed a bill passed by both the House and Senate that would have prevented drivers from texting while driving. (Dallas Morning News's Report) Governor Abbott has indicated that he is of similar mind with Former Governor Perry, who voiced concerns that the government was "micromanag[ing] the behavior of adults" by enacting this law. 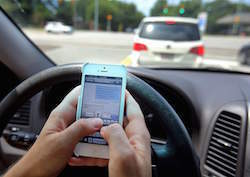 However, the state is not without precedent for limiting texting while driving. does have a law that prevents cell phone use for everyone while in a school zone and anywhere for drivers under 18 years of age. Additionally, many Texas cities, including Austin, have enacted laws that prohibit drivers from using a cell phone at all, be it texting, talking, or for gps, without handsfree assistance. We previously discussed that new ordinance here. The legislature is scheduled to remain in session through June 1. In any event, we will soon know what the legislature and Governor Abbott choose to do with the proposed ban on texting while driving.